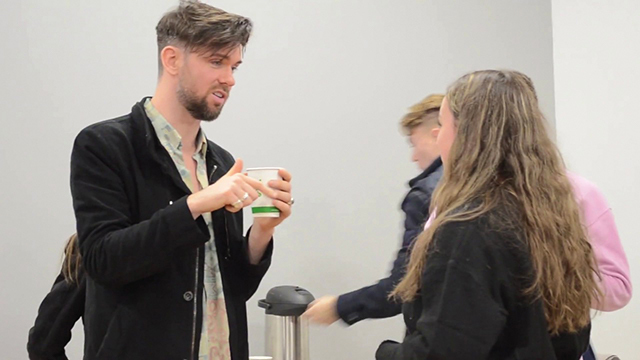 Eoghan McDermott talked to students in the Hive last week about his issues with mental health. Mental health ambassador Eoghan McDermott met with DCU’s Mental Health Society members in The Hive on November 20th. McDermott spoke about his mental health difficulties he faced when he was 26 years old. He lived in London and worked in Xfm, at the same time he just got out of a long-term relationship. “I was never emotionally tested before and I found myself in an isolated bubble,” said McDermott. He opened up to a friend who was in a similar situation and he gave him great advice and since then, he has taken care of his mental health and he became an advocate for Pieta House. “It was great to get such a modern approach to mental health. It was something I’ve never witnessed before. Eoghan clearly had been in the same shoes as us so he understood the student lifestyle and how mental health waivers when we get to this stage in life,” said DCUSU Humanities and Social Sciences Representative Adam Healy. “For me specifically, it was really encouraging to get some first hand experience from such an established mental health advocate,” he continued. McDermott went onto say that there is a lack of effort put into children’s mental health and that charities such as Pieta House “pick up the slack” for the government’s lack of work. “There is a difference between your mental health and a mental illness,” said McDermott, explaining that mental health can be impacted by a reaction to a period in one’s life, meanwhile a mental illness needs to be looked after the same way a physical illness is. He also said that physical health is easy to deal with when mental health can be difficult and embarrassing to get treated. McDermott said that he interviewed Taoiseach Leo Varadkar recently and he described the negative comments under the interview as being a reason as to why he doesn’t use social media as often as he used to. He also said that the generation of younger people who have grown up with mobile phones, are dependent on the amount of likes they get and this can impact their mental health. He believes that they need to understand the difference between virtual lives on social media and reality. The 2FM broadcaster has a degree in politics and Irish. He is also the voice of Love Island Australia.